At Balcells Group we have helped many clients worldwide with their real estate issues. Many times, after they obtain their residence permit, they want to buy a property to live in. And that is the moment when doubts start arising. Doubts regarding the taxes one needs to pay, questions about the legal procedure of buying or selling itself… The lack of information is something real and it is something that creates tons of headaches. But in this post, we want to clear all your doubts. After answering the same questions over and over again via email and through the consultations we have with our clients at our office, we gathered them all in this article. Would you like to learn everything to know when buying or selling a property in Spain, especially as a foreigner? Then make sure to read this whole article. 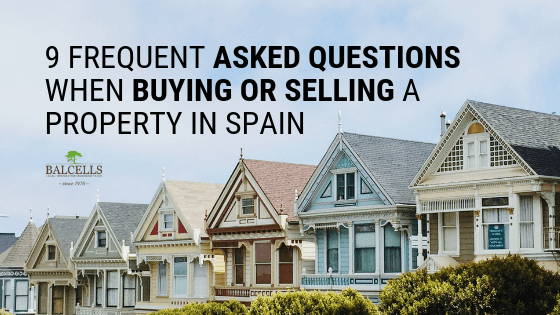 We will go over the 9 most frequently asked questions about properties in Spain. 1. Which are the taxes you need to pay when buying a property in Spain? If you buy a house or a flat in Spain, you will need to pay the property transfer tax. How much is that? The answer to that question depends whether the property is new or not. When buying a second-hand property, the PTF is equivalent to 10%. But, if we are talking about a completely new house/flat, you should add an extra 1,5% in terms of registration. Being under 32 years old means that the 10% before mentioned would be reduced in half, paying just a 5% on property transfer tax. 2. And when selling or renting? Selling or renting a property means that you will be registering an income from the transaction. And, as you may know, income in Spain is taxed via capital gains tax. The exact amount will depend on your exact situation, but we are referring to a range between 19 and 23%. If you are a Spanish resident or not will make that rate be higher or lower. For example, if you are a Spanish non-resident but you live in another European Union country, you will need to pay 19%. But there is an exemption! The main home exemption means that if you sell a property and reinvest the amount you gained to another property (which will be your new residence), you don’t need to pay capital gains tax. 3. How long does it take to buy a house? That is a question many clients of us ask, especially because of how fast they would like the process to be. And that is something completely normal. You find a new flat. Usually, you are really looking forward to a new place to live, with a lot of desire. You would like to move there as soon as possible to start your new life. That is why you should be cautious with the answer we are going to give you. Once you have found your desired residence, you can buy your new house in just 1 or 2 weeks. But the exact time will also depend both on the seller and the agency. The most complicated part (therefore the one that can take longer) is the due diligence. 80% of the time spent on the due diligence is to check the registration certification, and the other 20% to check the technical things of the flat (conditions of the building, any problems with the neighbors, pending payments, etc.). So if the “nota simple” is fine, the due diligence can take up to just 2-3 days; having the whole purchasing process in just one week. But do not get too excited with the speed of the process. Calm is advisable here, and it is something we immensely recommend. Because you need to go over the whole process, doing the required paperwork, and making sure you don’t forget any step or clause. 4. Is there any possibility to have the architectural supervision before the pre-sales agreement (contrato de arras)? You already know that during the purchasing public deed phase, in which you draw up and sign the contract, it is really advisable to hire an architect in order to report with is the actual flat or house situation. The question here is whether you can hire the work of the architect before the “contrato de arras”, the pre-sales agreement, in which you pay 10% of the total amount. Why would it be useful to do the architectural work before? Because after the 10% payment is realized, you won’t recover the money if you decide you don’t want to continue with the property purchase afterwards. And the answer to that question is yes. The technical report can be done before, but that is something that must be agreed with the seller. In that sense, at Balcells Group we started developing a step that has yielded a positive outcome for our clients. What are we referring to? We now call the administrator of the building, someone who has a lot of information regarding the flat you would like to buy. With that, we want to gather as much technical information about the house as possible. She is the one who will tell you to be careful with the floor, the lights, etc. And that conforms one of the best ways to identify any possible damages in the property that could be detrimental for the buyer if left unseen. 5. If I ask for a loan, how much money will the bank give me? Is there any restriction? Nowadays banks will usually give you from 60 to 70% of the price of the property. Financing used to be 90% of the purchasing price if you were a Spanish resident, but they have become more conservative, especially if you are an expat. But be careful. When we talk about 60% of the price, we are not talking about the real price of the house you are intending to buy (market value). It is 60% of the evaluation they do of the property. So there is a difference between what the bank considers the actual price is and the price you end up paying. The loan is issued on the evaluated price, which is emitted by an architect that works for the bank (you cannot be the one hiring him or her). How big is that difference (between evaluation and selling price)? Banks usually undervalue when the property is located in an area in which the market conditions for the future are unknown. On the other hand, if you live in a big city such as Barcelona, in which the market is solid, that difference will not be that big. In terms of restrictions, there are none. The bank analyses your capacity to pay the loan back, and your ability to do so is the only restriction. It does not have to do with any district or area the property is located in. It responds to an internal evaluation process from the bank, based on the evaluation of your (future) solvency. 6. Can you buy a house without “cédula de habitabilidad” (certificate of occupancy)? The certificate of occupancy is a document that accredits that a certain house or flat gathers the necessary conditions of health and hygiene that make it available to live inside. This document is fundamental when buying a property, as you will need it to register on all services such as water and gas. Can you buy a property that does not have the certificate? Well, you actually can, although it is not advisable. Why? Because if you start living in the property without “cedula de habitabilidad” and you get an inspection, you can receive an important penalty, as it is something illegal. 7. What if I would like to buy a local to turn it afterwards into a flat with conditions that make it able to live in? Let’s imagine the next situation: you find a really nice local in a neighborhood that you really enjoy, and would like to turn it into your residency. How should you proceed legally here? In that situation, you need to request to the City Hall a license, a license to turn the local into a property apt to live in. But there is the possibility that the City Hall denies your request if the property does not fulfill the necessary requirements. The technicians of the City Hall are the ones who will approve or not to change the use of the local from business to living mode. And, for that, you need an architect report. Then, our advice is to be careful. Before buying the local (with the hope to turn it afterward into your house), get an appointment at the City Hall to check the availability of the place. You should ask how likely is it that that certain property (now a local) can be converted into a house. They will advise you before submitting the application, and with that, you will avoid losing a lot of money. Why? Because they can only give you an actual NO after the application is submitted after you have already bought the property and try to change it into a place to live. So before buying, ask if it will be possible or likely to happen. 8. Is there any restriction when renting a house or flat? Tourist rental. This contract will enable you to rent your property for days or weeks only. You need a license from the City Hall in this situation. Seasonal contract. This contract is up to more than 30 days. We are referring to the so-called “contrato de temporada” in Spanish. Then there is a specific contract for rentals which last less than one year, 11 months for example, which is something usual. And, finally, long term rentals, usually from 5 years on. You can agree on anything here, according to rent for more than 5 years. 9. Should I hire a real estate agent? Finally, one of the first questions that our clients ask us whenever they enter our office to solve their real estate issues. Should I hire a real estate agent? The answer is: it depends. There are really professional real estate agents, which are really honest. And then you have others that… well, not so much. There is no real need for that. A specialized property lawyer will do the job. Why? Because it will guide you throughout the whole process, defining which documents and legal steps should you follow at any moment. And that is the best recommendation we can make to you: have a lawyer next to you when buying your house in Spain. We have helped over 1000 clients worldwide with their legal issues in Spain, and now we would like to help you. Should we start?